Australian Jeff “The Hornet” Horn (17-0-1) is expected to take on Londoner Gary “Hellraiser” Corcoran (17-1) in the maiden defence of his WBO world welterweight title. Promoter Bob Arum, who co-promotes Horn, has suggested that the WBO world title fight will take place at the SunCorp Stadium in Brisbane on Friday 15th December, televised live on ESPN. Brisbane’s Horn, 29, won the WBO belt last July with a highly controversial decision against eight-weight world champion Manny Pacquiao. “Pac Man” was expected to agree to a November rematch but pulled out due to his Senatorial duties in the Philippines taking priority. Corcoran, 26, has been described as a fringe contender, whose biggest fight came in July 2016, when he suffered his only career defeat in a British super-welterweight title showdown with bitter rival Liam Williams. Managed by Frank Warren and trained by Frank Greaves at the Peacock Gym in London, he dropped down a division after that sole loss and recently edged past unbeaten Prizefighter winner Larry Ekundayo by split decision on July 8 to claim the vacant WBO Inter-Continental welterweight strap. Winning that belt placed him at no.10 in the WBO world rankings, seven spots below stable-mate Bradley Skeete, also signed with Warren, who many anticipated winning the shot at the world title. Horn’s selection for his first defence has been criticised by some, but his pick of a top-10 ranked opponent with the same number of wins should make for a good contest, even though “The Hornet” has one eye on a bigger fight in 2018 with either Crawford or Pacquiao. Corcoran beat off WBO#3 Bradley Skeete, #8 Luciano Veron and #10 Ray Robinson to land the world title shot down under. Arum favoured Corcoran’s style over other possible contenders, “Corcoran at least will bring the fight to Horn,” he said. “We are clearing a location in Brisbane and then we can go ahead with the fight, which will now take place in December instead of November, which is what we were originally planning,” Arum said the fight probably will take place on Friday 15thDecember in Brisbane. “We are waiting for the guys in Australia to finalise the plans for the stadium in the next day or two. They’re finishing that up and then we’ll send out the contracts, but everything is done with (Corcoran promoter) Frank (Warren) for the fight,” said Arum, adding that the Queensland government is heavily involved in bankrolling the fight, as it was when Horn faced Pacquiao in one of the biggest bouts in Australian history. 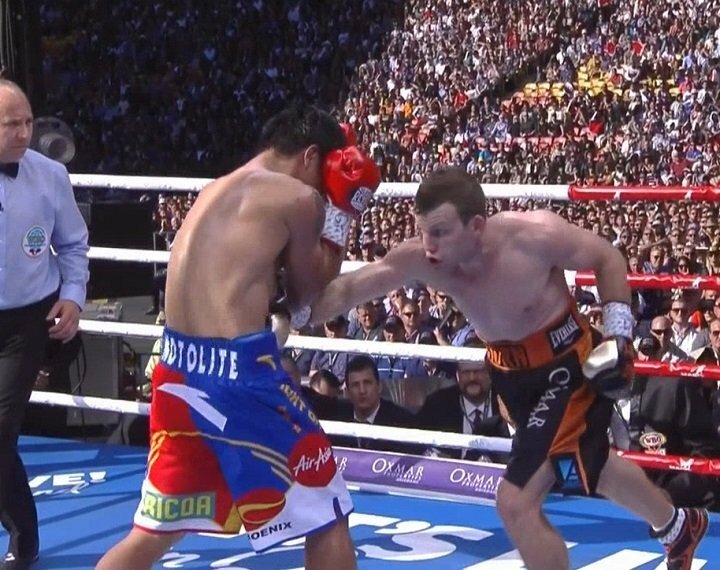 Horn won a debatable decision against Pacquiao on July 2 before a crowd of 51,000 at Suncorp Stadium in Brisbane in the first main event of Top Rank’s deal with ESPN. Pacquiao, boxing’s only eight-division world champion, nearly knocked out the 29-year-old home fighter in the ninth-round but couldn’t put him away. Most spectators thought Pacquiao, who had been bloodied by multiple cuts from accidental head-butts, was the clear winner, but he ended up losing his 147-pound world title by a unanimous decision on scores of 117-111, 115-113 and 115-113. Pacquiao had the right to an immediate rematch and said he planned to fight Horn again in November, but changed his mind because of a busy schedule with his day job in the Philippine Senate. He may return for the rematch in 2018 providing that “The Hornet” gets past the “Hellraiser” first.